Happy New Year from Co|So! 2019 means new resolutions, new exhibitions and the 140th anniversary of the Copley Society of Art! To celebrate Co|So’s anniversary, we will be giving a recap of the first major exhibition hosted by the Copley Society of Art to give an interesting sneak peek into the beginnings of a long and illustrious history. The year was 1897 and the exhibition was One Hundred Masterpieces, hosted in the Grundmann Studio building with works on loan from the Museum of Fine Arts, Boston. Many of the world's most famous masterpieces were on display right here at the Copley Society. Jean François Millet was born in Gruchy France. The celebrated painter is noted for his simple and empathetic representations of peasant life. He worked with his father as a farm laborer most of his young life, but in 1837 he moved to Paris and studied with Paul Delaroche. At the beginning of his career he wrote, “I must draw diggers, sowers, men and women at the plough, without cease… I no longer stand as helpless before nature as I used to do.” In 1840 his first work, a portrait, was accepted into the national Salon. By 1849 he settled in Barbizon, where he remained for the rest of his life. This painting is currently on display at the Museum of Fine Arts, Boston, along with many other French masterpieces. Born in Boston in the year 1836, Winslow Homer is regarded as one of the greatest American painters of the 19th century. He began his career as a self-taught commercial illustrator, but shortly began working with oil paint and watercolor. Though he lived in New York City, he often traveled along the Hudson River and New England to camp, hunt, and of course, sketch. Of Homer’s work, his seascapes are among his most highly regarded paintings. You can currently see Adirondack Lake at the MFA. Valley of the Creuse was one of the first Monet paintings to join the MFA collection, and is a prime example of his innovative use of color. 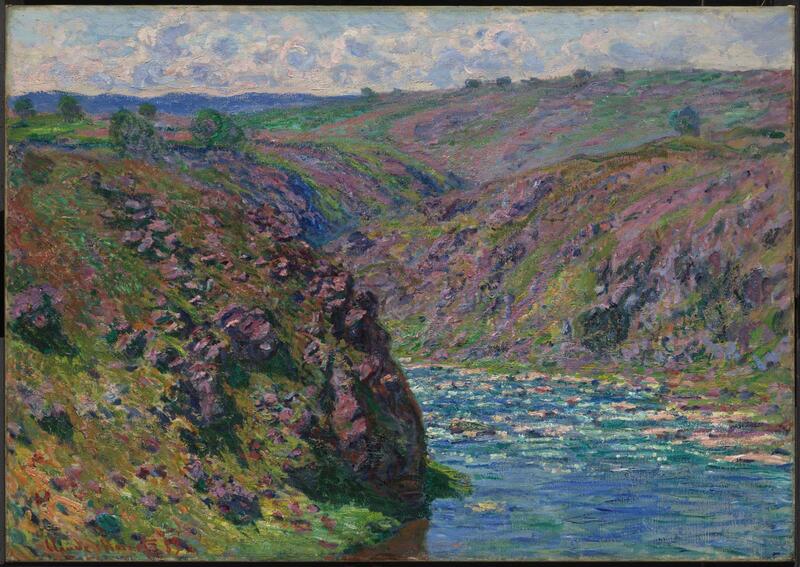 Monet paints the River Creuse, in central France, as a magical place through his use of purple, blue, and green hues. The father of Impressionism was known for painting en plein air, a technique that allowed painters to capture natural light. You can see this painting on display at the MFA along with many other Monet paintings in the gallery entirely dedicated to the artist. Édouard Manet served as a pivotal figure for the impressionistic art movement. Though Manet never considered himself a member of the group, Claude Monet was greatly inspired by his use of light and his challenges of the Academic style. This painting of leisure captures fashionable Parisians enjoying their time in the Tuileries Garden. This painting is often regarded as one of the most important paintings to inspire Impressionism, as, unconventionally, color takes precedence over drawing.